Provide MORE VALUE To Your Members Each Month With JV Membership! Discover How To Add Incredible Value To Your Website So Your Customers LOVE You Without Lifting A Finger! For 7 years now Master Resale Rights Club has been providing new, in-demand quality products to its members every month without fail. During that time it has become clear to the Administrator that there is a distinct need for webmasters and program owners to use an external source to furnish their own members with extra value each month. But there is also a strong desire to achieve this end without paying a small fortune each month to do so. Is affordable for membership site owners to participate in each month. Provides up-to-date products in the latest niche markets. Starts with a good, solid base for members to browse through. Will include longevity allowing the members to benefit for a long time to come. Provides our members with the ability to increase their own membership site profits through our membership site in a mutually beneficial joint venture. Most importantly, the features of this membership level would need to be quick and easy to implement, even for the most non-technical person, so it could be up and running within seconds. The Perfect Solution For Adding INSTANT VALUE To Your Site! Listen, it really can't get much easier than this, because we've intentionally made it as simple as possible for you to include on your website, and start generating more profits instantly! That's right. It's that good! Instant access to more than 2000 master resale rights products. 10 or more new products added to the download library every month on the 10th of each month. What type of products will your members be able to access? If Each Product Currently In Our Library Was Valued At An Average Price Of $25, Just Imagine What The Impact Of Instantly Adding More Than $29,160 Worth Of MRR Products To Your Site Will Have On Your Members! We Already Know What Will Happen Because It's Happened To Others Already... They Will LOVE You! Plain & Simple. There's no need for you to host the products, because we look after the cost of the disk space and the download bandwidth. We even take care of the customer support for any download issues on your behalf so you don't need to worry about it at all. Each month, the value of the download library increases providing your members with even MORE value (that you can very well charge for). You can charge your members for access to the library from your website. Imagine if you had just 500 members paying you $10/month for access, that would generate an extra $5000 per month for you, and that's just a conservative guesstimate! You could certainly charge more than that if you wished because you're currently paying $14.95 per month to download the products manually yourself now. Alternatively, you could decide to give it away as a bonus to your current paying members by asking them to opt-in to another list you own, thereby building your customer base even further. Having this incredible resource on your website empowers you to bargain more with other external sources giving you more joint venturing power. If you're ready to add some absolutely astounding extra value to your website quickly and easily, then you're ready to upgrade to our JV Membership. Simply Copy & Paste Our Special Code To Your Web Page To Display The Master Resale Rights Club Download Library! Once you upgrade, you will get a special code to paste it into your website. 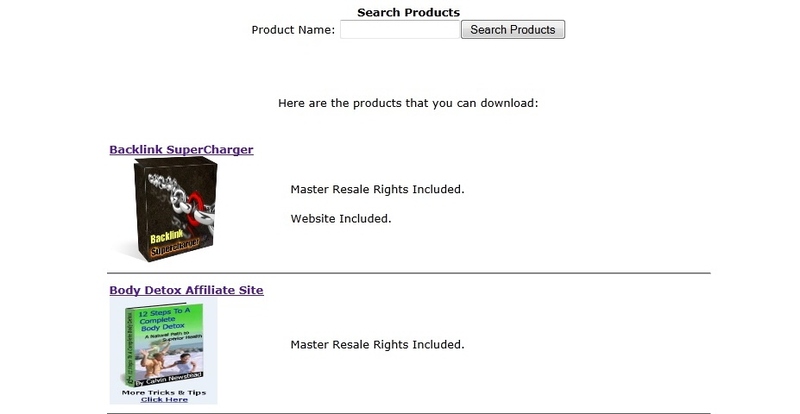 Refresh the page and you'll see the Master Resale Rights Club download page displayed on your site as shown below. Honestly, can it get any easier than that? Payable via PayPal/Credit Card/Debit Card subscription. That's chicken feed when you consider how much profit you can make from charging your own members on your membership site! We look forward to hearing about the success you've achieved by making the smart decision to upgrade your MRRC account today.